Original Dr Antonio Martins coco. 100% organic quality. 100% young coconuts from small farmers in the best growing areas, almost all of whom we have known for over ten years. Dr Antonio Martins contains no GMO, no preservatives and no trickery. Using a patented process which we fought long and hard for, coconut juice is handled with such care from harvesting to bottling that we often say it does not even notice that it is no longer in the nut. Dr Antonio Martins uses a sophisticated system of micro-filtration, gentle heat treatment and cold aseptic, or sterile filling. The only thing that is added to our coco products is a little vitamin C (also named ascorbic acid; so that the coconut juice does not go brown under the influence of oxygen). Just try out some other coconut juice brands. You will quickly taste the difference. It is best to be as demanding of coconut juice as we are. Then, even without the big slogans from advertising, you will soon choose Dr Antonio Martins coco. We look forward to that. Dr Antonio Martins’ answer – coconut juice. The only problem was, you could not buy coconut juice in Europe because coconut palms cannot grow here. Many years were spent looking for small farmers, certifying coconut plantations as organic and developing a process that gets the delicate coconut juice from the fresh, young coconut into bottles and packaging in such a way that it retains both its value and its flavour. This is not so easy if you want the coconut juice from young coconuts to be processed as little as possible and do not want to use any preservatives or other chemicals. In 2004 it was finally accomplished. That is how long original Dr Antonio Martins’ coco has existed. And how long many thousands of satisfied people all over the world have been saying, “For me, coco is the best coconut juice ever”. Thank you for always believing in your idea, Dr Antonio Martins. Now we can drink coconut juice that tastes like it is fresh from the young nut. So easy to buy from the shop around the corner. If you drink Dr Antonio Martins coco, sooner or later you will come across a company: green coco europe GmbH. That is simply the company that Dr Antonio Martins founded, together with friends and experienced specialists from the beverage industry and organic branch, in order to bring coco to people like you all over the world. The most important thing is, green coco europe is anything but a major company or one of these corporations that lack transparency and that you cannot trust. Or those where you do not know who they actually belong to. green coco europe is based in Nuremberg in a bright old building on Prinzregentenufer. A small team of 10 employees, under the experienced leadership of Stefan Reiß, puts much blood, sweat and tears into bringing Dr Antonio Martins coco from the country of harvest to the shelves of your favourite shop. green coco is an open company. If you have any questions, or maybe even want to work with us to make Dr Antonio Martins even more successful, feel free to contact us any time (> Contact team). The coconut palms for Dr Antonio Martins grow in the tropics. More specifically, 1,000 kilometres either side of the equator. This is because in order to be happy they always like it to be consistently warm and humid. To be even more specific, the mothers of our coconuts grow in Brazil, Sri Lanka and in the Philippines. For over thirteen years we have spoken to many small farmers and local cooperatives and established long-term contracts. Many even with just a handshake, because trust is our greatest asset. We know that we can trust our suppliers, and our suppliers know that they can trust Dr Antonio Martins. Together we have certified the plantations as organic and we continue to work on ensuring that more and more plantations are managed sustainably, so that we can harvest valuable organic coconut juice. All of the growing areas have existed for many years. No rainforests have ever been cut down to create space to cultivate coconut palms for Dr Antonio Martins. Since the very beginning we have made sure we only buy coconuts from existing plantations. And that will not change in the future. We do not want any coconuts from new growing areas for which rainforest is often destroyed. We would rather accept the fact that you will not always be able to find every coco product on the shelves. Because we know that our customers appreciate that nature cannot simply be expanded at will. The cultivation of organic coconut palms is very natural. They grow as nature intended. No greenhouses, no fertiliser. No GMO. All organic. Pure taste. And the raw material recovery process is also no secret. Nut open – juice out. The coconut farmers harvest the coconuts and take them to our partner businesses in the country in which they were grown. There, the young nuts are opened and the fresh coconut juice is immediately filtered, gently pasteurized and flash-frozen. As fresh juice, not concentrated. Dr Antonio Martins coco is an honest product: the liquid contained in the young coconut, as unadulterated as possible. Coconuts do not grow at our latitudes. A long transport route is therefore unavoidable. But right from the outset, Dr Antonio Martins has aimed to keep the negative impact of our actions in the production and sale of coco products as low as possible. In order to minimise CO2 emissions, we do not transport any whole coconuts, instead we extract the coconut juice in the country in which they are grown. We flash-freeze it for best quality and send it by sea on the journey to Europe in special freezer containers. This allows us to save weight and volume and make use of the excellent efficiency of large container ships. According to recent studies, the amount of CO2 generated when transporting oranges from Sicily to Central Europe by truck is similar to that produced by intercontinental container ship transport of oranges from Brazil to Central Europe; calculated relative to the number of oranges, of course. Of course we are not yet satisfied with this. That is why in a project in 2010, we analysed the CO2 emissions during the cultivation, transport and processing of Dr Antonio Martins coco and interpreted this as a carbon footprint. As part of our company goal of sustainability, we subsequently started to make some of our products CO2-neutral. You can tell by the MyClimate certification on the packaging. If you are still not sure, put your trust in Dr Antonio Martins coco – then you can’t go wrong. We promise you with conviction. The original idea was in fact a little more ambitious. Dr Antonio Martins wanted to combine the pure coconut juice with fruits that can round off the nutritional value of the young organic coconut juice. And as a side benefit, try to utilise the empty space under coconut palms for cultivation. Initially we hit upon bananas, pineapple and acerola cherries. 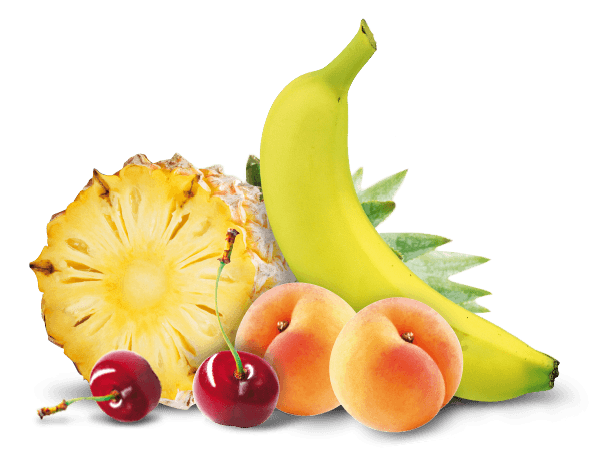 The disadvantage of deliciously sweet fruits is that they contain a lot of sugar. And sugar of course contains lots of calories. What if you would like to drink flavoured coconut juice, but the low energy content of coconut juice is important to you? We have found a solution for this too. 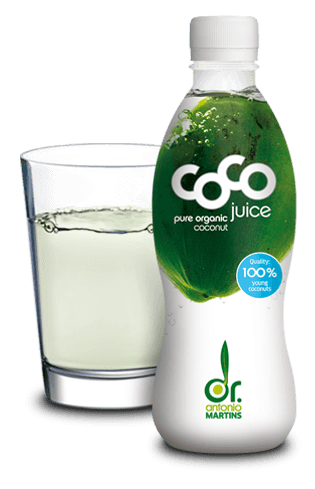 Flavoured Dr Antonio Martins coco – there are no other fruit juices in the pure coconut juice, instead there are only valuable flavour extracts.. You could say we take the flavour from the fruit and the calories are left out. Organic bananas – taste sweet and delicious; rich in potassium and energy. Organic pineapple and organic acerola – tastes exotic; rich in vitamin C and enzymes. Organic apricots – sweet and refreshing; rich in vitamin A.
Organic white peach and organic green tea – harmonious and subtle. 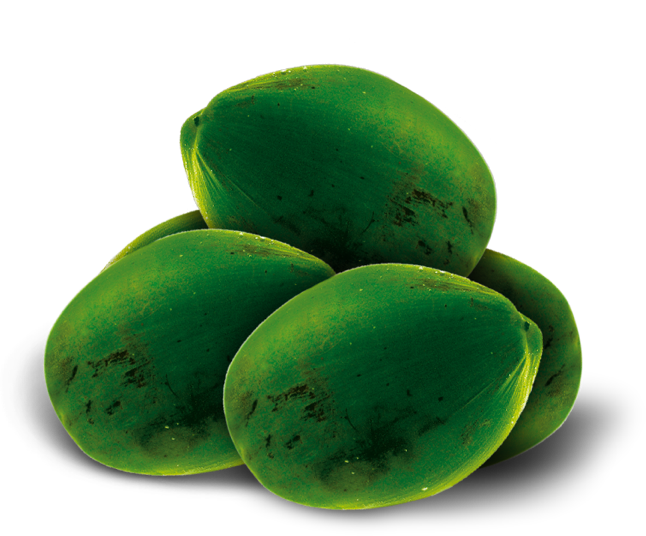 Organic mango – full-bodied and exotic. And if you are looking for a change, you are even luckier than the people in Brazil – just try coco mixed with fruit or with fruit flavours. Coconut juice is a very delicate natural product. The best way to drink it is of course fresh and straight from the young coconut. But because they cannot grow at our latitudes, Dr Antonio Martins spent a long time working out how to bottle and transport coconut juice of a quality that comes as close as possible to the natural product. It was always a matter of achieving the best quality and preserving as much as possible of the vital substances of the fresh coconut over a long period of time. Nut open – juice out. This sounds easy but requires a lot of experience and expertise – especially with the demand of being certified organic – to provide a coconut juice to you which is as close as possible to the young coconut on a sandy tropical island. The coconut farmers harvest the coconuts and take them to our partner businesses in the country in which they were grown. There, the young nuts are opened and the fresh coconut juice is immediately filtered, gently pasteurized and flash-frozen. As fresh juice, not concentrated. 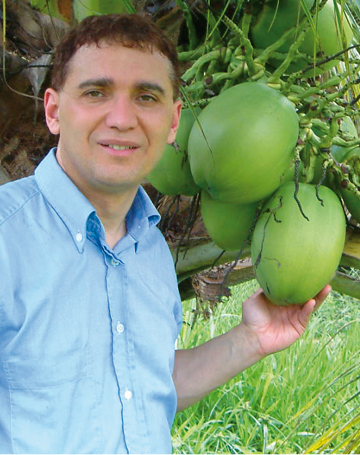 Dr Antonio Martins coco is an honest product: the liquid contained in the young coconut, as unadulterated as possible. The bottling itself then takes place in a finely coordinated cold aseptic process. All of this together makes original Dr Antonio Martins coco coconut juice hardly any different from that of a fresh coconut. Pay close attention to which coconut juice you buy. Particularly products that have not been produced in the EU are often made with preservatives (products in cans are often questionable). And heating to high temperatures also makes products long-lasting, quickly and cheaply – but this also changes the quality and taste of the coconut juice (you should be dubious about noticeably sweet products, often with an obvious caramel taste). After intensive research and several hundred hours of testing, in 2002 Dr Antonio Martins developed a complex mechanical treatment process and had it patented. Over the years we have intensively developed our entire raw material chain, from cultivation through harvesting and production to transport and storage, in order to always be able to offer the best coconut juice in the world outside of a young coconut. This is not actually just our belief and our mission – independent testing institutes and international competitors are of the same opinion. Dr Antonio Martins coco is always winning top awards – for example, the Gold Best Taste Award from the Fine Food Guild in the United Kingdom. All of the raw materials and processing methods for Dr Antonio Martins coco are 100 % certified organic. coco carries the EU organic logo as well as the local organic certification marks in Germany, Austria, Scandinavia, the USA and Canada. There are also other certificates and certification marks for food and production safety, energy management, environment management, carbon neutral production, warehouse and logistics, sustainable packaging material and the certification of the Vegetarian Society for product quality. The taller the tree, the sweeter the fruit? Coconut palms are real giants: 20 to 25 metres in height is totally normal. So in many tropical countries they are also called the “tree of the sky”. For the coconut harvesters it is much less practical. 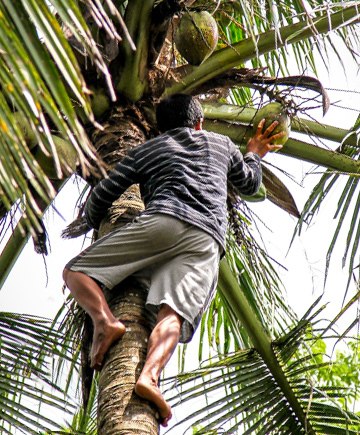 The taller the palm, the more laborious, dangerous and expensive it is to collect the coconuts. In many countries monkeys are trained and sent up the palms to harvest the coconuts. It is easier with low-growing coconut palm cultivars – they exist too.